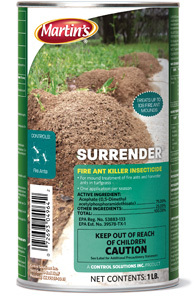 Surrender Insecticide- ACEPHATE 75 FIRE ANT 1 lb. Can Fire Ant Killer Insecticide For mound treatment of fire ants and harvester ants in turfgrass. One application per season. Treats up to 108 fire ant mounds.